A New Map of Sweden, Denmark and Norway. 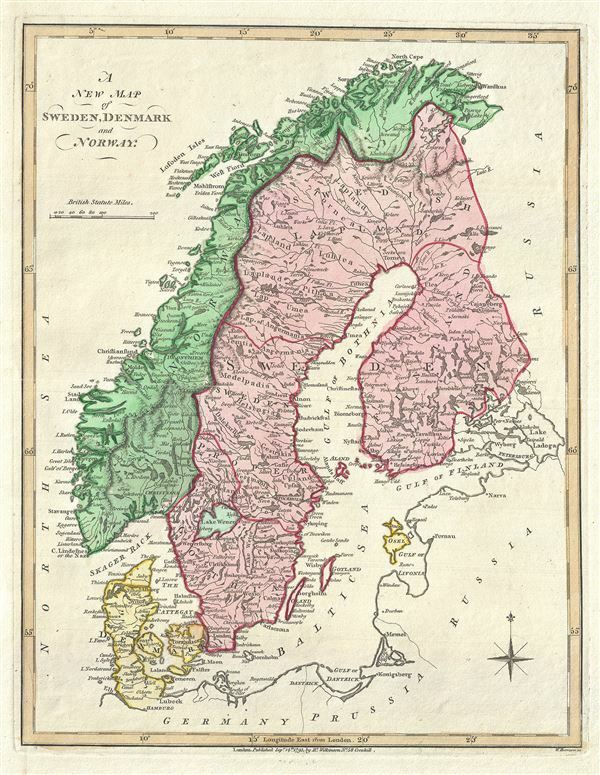 This is a finely detailed 1793 map of Scandinavia, by Robert Wilkinson. It includes Norway, Denmark, Sweden and Finland (then part of Sweden). It features the Lapland region as a whole, including its provinces in Finland and Sweden and shows the adjacent countries of Russia, as well as the Baltic Sea, Gulf of Bothnia, and Gulf of Finland. The legendary and semi-mythical whirlpool known as the Maelstrom (Mahlstrom) in northwestern Norway is noted. This legendary whirlpool was the inspiration for Edgar Allen Poe's classic tale 'Descent into the Maelstrom.' In reality, it is a periodic and powerful current caused by tidal variations in the region. Beautifully rendered mountains and fjords and gorgeous colors throughout make this an exquisite addition to any collection. This map was engraved by Thomas Conder and issued as plate no. 4 in the 1792 edition of Robert Wilkinson's General Atlas.